Kindness is a beautiful thing. It not only has the potential to make someone's bad day that little bit better, but it gives you the warm fuzzy feelings inside too. 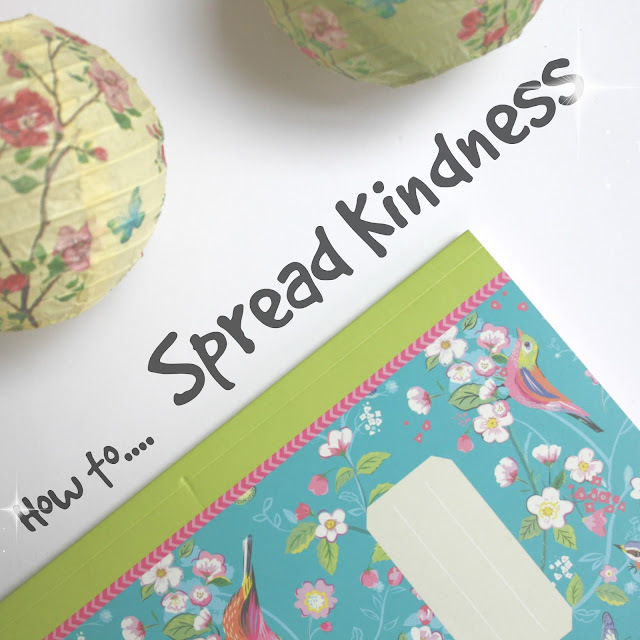 Today I'm sharing a little guide to things everyone can do to spread a little more kindness in their lives. Most of these things are entirely free and take very little effort, so incorporating a bit more kindness into your daily routine couldn't be easier. This is also a collab post with the lovely Abbie from abbiechic.com - Abbie has written a 'How To' guide as well, all about being embracing your introverted side! Make sure you hit up her blog after reading this post! Now, the first thing to remember about spreading kindness will be familar to any of you who have taken a flight on an aeroplane. (Weird, right? But bear with me). Do you remember what the safety announcement says regarding oxygen masks dropping down from the ceiling? That's it - put on your own mask before you help others. This is because you cannot fully help others if you pass out from a lack of oxygen yourself! The same thing can be said about kindness. In order to be kind to others, and give them the full benefit of our positive actions, we need to be kind to ourselves. Being kind doesn't mean that you need to be an emotional doormat. You are SO important and you also deserve to be treated well and respected. Don't let anyone take advantage of your kindness. Reach out to someone who's feeling sad. Even just one positive tweet can make a difference! Be a cheerleader. If you're loving someone's blog content, tell them! Send them a tweet or write them a nice comment, you'll probably make their day! Smile at everyone when you walk down the street. Make people feel welcome and appreciated. If you're hanging out in a group, ensure that everyone feels included. Leave a tip at the restaurant / coffee shop. Even if it's just a few pence change, every little helps! Hug your friends / family members. Offer to help. Even if that person says no, they'll appreciate the offer. When buying gifts, have a long think about what the recipient would really adore. A well thought out present really puts a smile on someone's face! Offer genuine congratulations! Is someone getting married? Are they having a baby? Congratulating them will make them feel extra good! Let it go! If you've been holding a grudge - forgive! Write a little note for someone special to you and let them know you appreciate them. Donate to a charity shop. Got some old books or clothing hanging around? Donating helps good causes and gives you more space in your bedroom! Say thank-you. Simple but effective. Promote your friends. Does a mate of yours have an Etsy store, or offer graphic design services? Share their content! Find something to like about the person who annoys you most. Do the crap job. Nobody in the office or at home wants to do it, so be kind and take one for the team! Inspire others! Tell people you're on a mission to be kinder, and you might encourage them to do the same! Do you have any more tips for spreading kindness that you'd like to add? Comment below! Don't forget to check out Abbie's 'How To' post as well!